Both these devices the LG G2 and the Note 3 are in the price range of $670 which is out of reach of many people so if you have the money and want a classic and uniqe device for your pocket you must consider these 2 device before any other in this range. LG G2 comes with a unique design of absence of physical buttons on front and side of the device letting LG to make the device 5.2 inch display giving it the best resolution. The presence of buttons on back of the phone is something unique and for some takes time to get used to. To unlock and Lock the device the option of double tap on the screen is a good feature due to the absence of any buttons on the device. On the other hand Note 3 is also a very good device with a huge 5.7 inch display and its improved battery life it is a better device with increased S pen functionality like S pen Window, Full screen notification, S finder, Voice Control, Blocking Mode, improved multi window functionality and Call notification Window. With these features Note 3 is also a very good device in its price range. Here is the detailed comparison of both the models with its specifications and details in table form. Features Active noice cancellation with dedicated mic, Document Viewer(Word, Exel, Powerpoint, ). S-Voice natural language commands and dictation, Air Gestures, SNS integration, Active noice cancellation with dedicated mic, Dropbox(50GB), Document Viewer. LG G2 with is unique front and side button less design and the unique back power and volume buttons is catching the eye of users not only because of the design variation but also the features which are at offer from LG. The Display is very clear and bright doing justice to the effort of LG designers to get the maximum but giving the 5.2 display which is the optimum for 1080 x 1920 pixels and it gives the best clarity. I must say it take a bit of Adjusting to get used to the Back button and Volume rockers. But in the end i must say it is a device worth spending your money on. Note 3 is Samsungs latest features filled phablet at offer it surely crosses all the devices which Samsung has come out with because of its display and the S pen given a lot of importance compared to the previous versions. Another important factor is the improvement in battery life compared to previous models of Note it comes with a 3200 mAh battery which is sufficient to power the huge screen of the device and run with full functionality for a full day without requiring recharging. 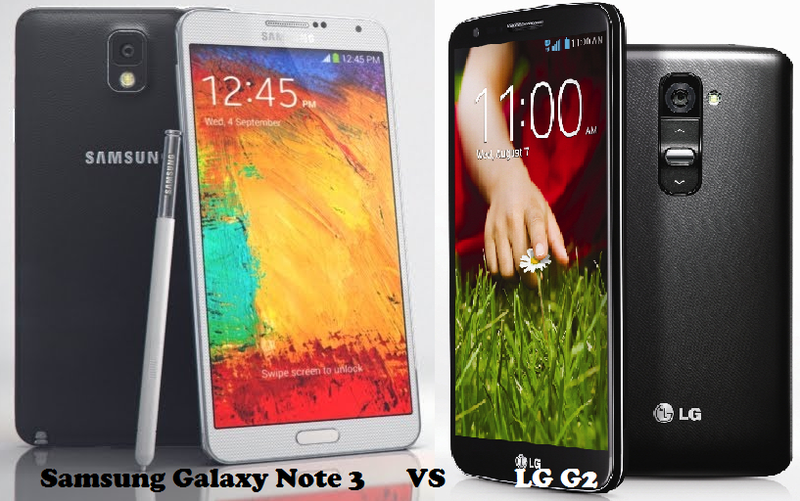 So if you ask me which device to buy between these 2 devices, i will say it is based on your requirements if you are happy with a hige 5.7 inch screen then it is the Note 3 to go for but if you are like me and are not comfortable carrying a huge device in your pocket all the time then surely go for LG G2 as it has the features and is equipped well to take on the competition and do justice to your money.